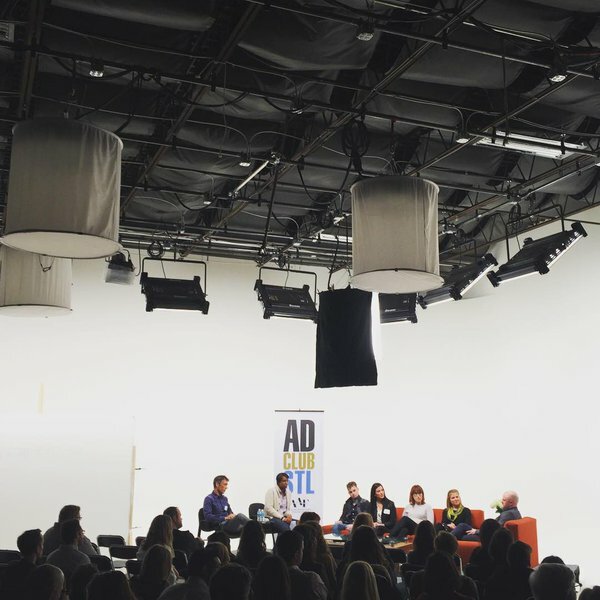 Now that the 2016 ADDYs are behind us and agencies around STL have nursed their hangovers, we at TOKY are taking a moment to reflect back on the events of Addy week and to be grateful for the city-wide participation that made the event so successful (as well as the personal achievements in the form of ADDY awards). But the week was about more than just the ADDY Awards themselves, though they were the pinnacle of local advertising design. Throughout the week leading up to the awards show, events were held around the St. Louis area that highlighted the best and brightest talent, networking opportunities, and educational opportunities for budding creatives. One of the first events was a series of panels — “The ADDYs Primer: Lambs, Ladies, and Leaders” — to get inside the minds of up and coming designers (the Lambs), inspiring women in the male-dominated industry (the Ladies), and some of STL’s most seasoned and awarded professionals (the Leaders). I sat in as a participant on the first of three panel sessions called “The Lambs” to discuss agency life from the perspective of notable young designers worth watching. The podcast for the entire panel can be heard below. In it, you can hear me give some advice for students looking to begin their creative career, along with some great observations from other guest panelists. Since then, I’ve been thinking a lot about my path from student to designer. I wanted to expand on this concept of “Lambs” and talk to the driven, creatively precocious students. Those bright-eyed designers with sparks in their eyes and fire their bellies to make something truly great work. I want to talk to the next generation of agency leaders. Your path to success as a creative is as unique and as driven as you are. Be flexible and open. Most creatives have a formal background in art and design, but which path is best — art school, grad school, something else? When asked about graduate school and whether or not I would recommend it to young designers and students, I’m up front about my path and decision-making process. For me, it was a specialized art degree following the traditional B.A. My program was a really good fit for me, but it depends on where you’re headed with your career. Your path may not be the same. Everybody’s route is different just as no two designers have the exact same set of talents. Find the path that nurtures your individual skills. It’s like finding a job in a way because not only does the school or program have to pick you, but you have to pick it in return. In grad school, and in your professional life, it is crucial to know yourself and your design process. One of the most valuable career learning experiences can be figuring out that process and how to apply it to a variety of different projects, both personally and for your employer. For example, while at TOKY, I particularly enjoy the challenge of finding ways to adapt my design process to satisfy client demands, while still staying true to a personal commitment to create beautiful and useful things. Your hands need to be as busy as your mind. For me, working with traditional materials like paper or stepping away from Illustrator to sketch by hand helps add perspective to my on-screen work. Sometimes designers can find new school inspiration and answers in old school methodologies. It can be difficult to separate the creative career from technology, but young designers should develop an appreciation for analog processes; they are the building blocks of creativity. Get a little bit messy first. Discovering how you work will inform your work and help you learn how to work with others. Finally, the best design is honest. So should you be with yourselves, young designers. Assess yourself and your work honestly, your talents and trajectory. Ask yourself what you want to achieve and consider where you want to land. Is it an agency? In-house creative? Or maybe you want to set up your own shop. Take a look at the schools out there, research their programs, and evaluate if those programs are in-line with your personal and career goals. If and when you choose to apply — be brave! You are designing your future.